This is a dead easy little recipe and ever so yummy! Whip the double cream until stiff peaks appear (around 5 minutes whisking). Gently fold in the mascarpone. When completely mixed, add the jar of Joe & Seph’s Prosecco Caramel Sauce and again, gently fold. Add the mix to ramekins, and put in the fridge to set. 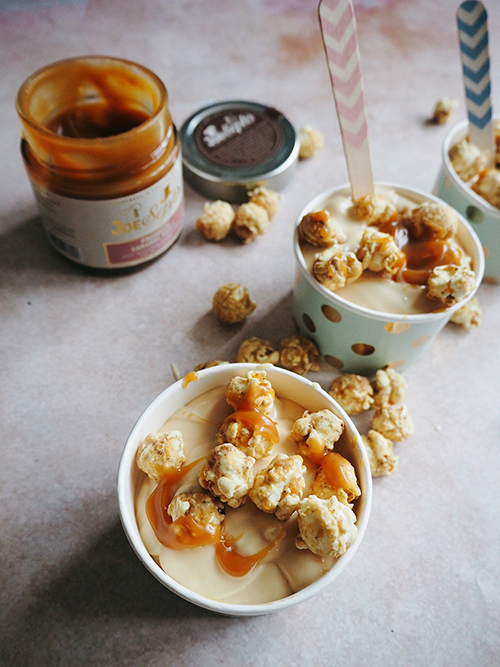 To serve, top with crunchy Joe & Seph’s White Chocolate & Vanilla Bean Popcorn!